These Avocado Oat Crackers with freshly crushed red chili, cilantro and lime are my favourite quick healthy snack or lunch. I serve the mashed avocado on my favourite oat crackers, The Oaty from Rude Health, or on toasted Oathie bread or muffins. Avocado boasts some amazing health benefits which are related to it’s high fat content. Avocados have a quite unique fat composition. Some of these fats plays an important role in reducing inflammation in the body Most of it’s fat content comes in the form of oleic acid, a monounsaturated fat. Oleic acid is considered to be a “good fat” which reduces levels of bad cholesterol in your blood and lowers your risk of heart disease. Avocados are a great energy source as monounsaturated fat is also easily burned for energy by our body. Avocado also boost the absorption from other nutrients in your diet, mainly the antioxidants lycopene and beta-carotene. By combing avocado with tomatoes in these Avocado Oat Crackers the lycopene found in the baby tomatoes is more easily absorbed. Avocados can also help you lose weight as it can boost fat-burning and supports blood sugar regulation. Use a fork to mash the avocado. Add lime juice and season with crushed red chili pepper to taste. 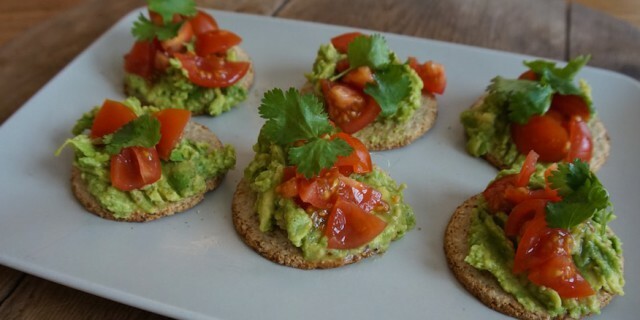 Spread the mashed avocado on your oat crackers and add some chopped baby tomatoes and fresh cilantro. Drizzle with extra virgin olive oil just before serving.